Francesco Guidolin had numerous absentees, most notably his two star forwards, Antonio Di Natale and Alexis Sanchez. He had to play Kwadwo Asamoah just off German Denis, the former Napoli player. Walter Mazzarri played his usual 3-4-2-1 system – Hassan Yebda continued over Walter Gargano in midfield, and Victor Ruiz started at the back. This game was highly anticipated for various reasons. Primarily, because Napoli and Udinese are the two sides punching above their weight in Serie A this season – 2nd and 4th coming into this round of fixtures – but because these are the two most tactically interesting sides in the league – whilst much of Serie A is fixated on playing slow, narrow football (leading the the popularity of 4-3-1-2 amongst the top clubs), these two are doing something different. Both have used a back three with wing-backs throughout the campaign, and can be considered Europe’s best three-at-the-back teams this season. There was a widespread belief that Udinese were set to switch to a four-man defence for this game. In theory, this made sense – three at the back against Napoli’s front three would have been dangerous, and besides, Udinese’s injury problems meant a change of shape may have been necessary anyway. However, Guidolin put out a complicated system that was at times both a back three and a back four, and this contributed heavily to the victory. First, it’s important to consider that there is often an element of lopsidedness to Udinese anyway. The recent game against Roma, for example, saw Pablo Armero on the left playing much deeper than Mauricio Isla on the right, because they had different marking responsibilities - with Roma’s Mirko Vucinic playing to the left. Vucinic’s positioning for Roma is actually not dissimilar to Ezequiel Lavezzi’s for Napoli – they both like to stretch the play and move close to the touchline without the ball, before drifting into the centre to provide a goal threat. Therefore, Udinese’s system was always likely to be slightly similar to in the Roma game – just a version adapted slightly to meet the demands of Napoli’s peculiar formation. Udinese essentially did three things very well. First, they retained a spare man at the back. Second, they contained Napoil’s wing-backs. Third, they won the midfield battle whilst also giving Napoli a threat at the back. The suggestion that Udinese would go with a back four was because they wanted a spare man at the back, rather than 3 v 3. It would be simple, therefore, to play a very narrow back four and pick up Napoli’s tridente that way – Mehdi Benatia up against Lavezzi, Giovanni Pasquale keeping an eye on Marek Hamsik (who plays more centrally) and 2 v 1 against Edinson Cavani. This often doesn’t work very well, however, because whilst the full-backs can tuck in and form a clear defensive shield against the three, this opens up space down the flanks for Napoli’s wing-backs – who then force the wide midfielders to get into extremely defensive positions, sometimes forming a back six. See the game against Roma, where the Giallorossi wide players switched off and the wing-backs had far too much space to scamper into, or the game against Genoa, where Genoa’s carrileros had to become auxiliary full-backs as there was no-one else to track the Napoli wing-backs, leaving the centre of the pitch bare. Therefore, Guidolin had a different plan. The key was the use of Gokhan Inler, who played deep ahead of his own defence and picked up Hamsik. The Slovakian played as a central playmaker, and took too long to realise that he was going to have to take up different positions to escape his man. This meant that Udinese would have had 5 v 3 at the back (extending that zone to include Inler and Hamsik) – not needed – so instead, Giovanni Pasquale could play higher up the pitch and occupy Christian Maggio. At the back, Udinese’s back three played to the right of centre, with Benatia on Lavezzi and Maurizio Domizzi on Cavani. Cristian Zapata was the spare man. 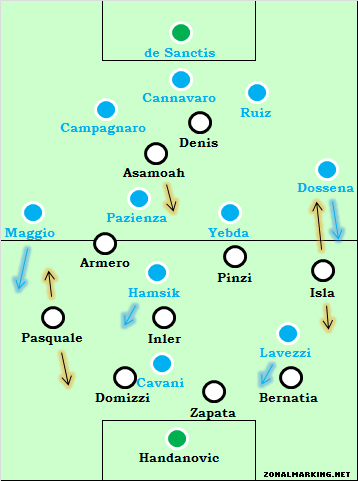 When Napoli’s build-up play was laboured, Pasquale could drop in as the left-back and Udinese would form two banks of four to give extra strength to the defence – but this formation only happened when Napoli held on to possession for a long period – in other words, when Napoli were camped behind the ball and weren’t going to be prone to late runs from the wing-backs, as they could see the whole ‘picture’ of play. Pasquale was pinning back Maggio, whilst Isla was doing an even better job against Andrea Dossena higher up the pitch. It was 2 v 2 in the centre of midfield, whilst Asamoah dropped goalside of Michele Pazienza to make up the numbers in midfield – before then sprinting forward to form a more traditional front two when Udinese won the ball – exactly as Sanchez had against Inter, which was the key feature of that game. Essentially, Napoli had nowhere to go. Udinese had a spare man at the back, they were tracking the runs of Napoli’s wing-backs with wing-backs of their own – something Napoli really aren’t used to – and when Asamoah dropped in, they also had a numerical advantage in the centre of the pitch. They were set up excellently to stop Napoli, and were on course for a clean sheet until Domizzi’s stupid 87th red card. None of this explains why Udinese won the game – their gameplan was based around defence. For goals, they had to rely on a tremendous strike from Inler to get in front, and then when Napoli left more spaces at the back, a quick break down the flank resulted in the second. This was rather clever from Guidolin – it confused Mazzarri and Napoli’s players, along with journalists who didn’t know whether this was a back three or a back four. “We’ve won a complicated match under precarious circumstances. The team could feel the coach’s trust and believed in the win. I really believed my boys could take this kind of match and they followed me” Guidolin said. What could Napoli have done differently? Mazzarri has been a master of keeping his broad system but changing small aspects of his side this season, most frequently by pushing Hugo Campagnaro forward from his right-sided centre-back position if Napoli had a surplus at the back (and therefore a shortfall elsewhere). This seems to be happening less readily in recent months, however, almost used only when Napoli desperately need to get back in the game. Compare this to the opening day draw with Fiorentina (where Napoli went ahead after a couple of minutes and were never behind in the game) – it happened instinctively there, and it’s a shame that Mazzarri has been a little more cautious in this respect than he might have been. 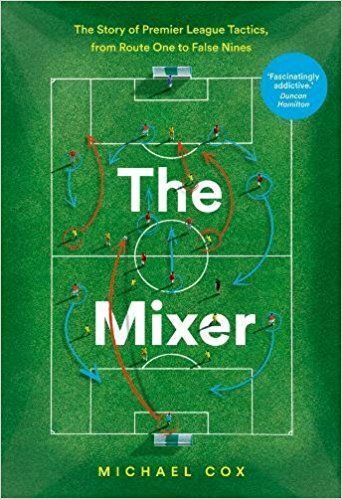 Thank you for this piece, which was a great read on one of the most entertaining (or less frustrating) of this Sunday in Serie A. It seems that the uber-craftsman Guidolin, a crouching coach, has given Mazzarri some of his own medicine: adapting to the opponent while keeping the broad system intact. I noticed that Gargano tends to impress a slight push higher up on the pitch, which makes Napoli look rather like a narrow 3-3-3-1, although with greater pace and potential for reactive soccer than most other teams. Yebda is a more traditional type of holding midfielder, which allows Lavezzi to stretch the play further down on the left. This is why, I think, Guidolin was wise, as you masterfully explained, to construct a lopsided barracking, able to soak up pressure almost like in sonic waves stretching from the left-inside. It is interesting to see how Asamoah played the “false nine” role, having a physical resemblance to the shuttling trequartista used by Allegri with Boateng–maybe a new development in an otherwise poor campaign in Italy. I wander if the recent positions of Inler here, Carrick with United in the FA cup, and even Melo a la Busquets, would not make a case for a return of the defensive Pyramid W. What is your opinion about this? I meant to write about it on my blog. Probably an even better video to illustrate the match, a 5 minute highlights. I think the second “Napoli” is supposed to be Udinese…?? Outstanding write-up as always ZM, very intriguing tactical battle and very complicated to comprehend for those not as tactically advanced! Thanks to you though, it’s so much easier to understand=) Guidolin showed his tactical capacity in this game, no doubt. Very well written. When the opening lineups were published, I was puzzled to see Armero and Pasquale in the starting lineup at the same time and their roles never really cleared up to me while watching the match since they didn’t exactly play the classical left back-left winger combination. This analysis puts Udinese’s gameplan in perspective. Well adapted by Guidolin. Some of the chaotic defending and botched clearings reminded me of the 4-4 Milan-Udinese match, yet thinking back, Napoli didn’t really carve any clear cut chances at any point. A draw would have probably been fair but top level football is a game of such small margins that a single wonder strike can make the difference in a match sometimes. I’ve been banging the drum of Udinese’s thin squad for some time now, and with Isla possibly out and Domizzi suspended, they’re really going to be tested over the next weeks. Fantastic report, Mr. Cox. These are the kins of games that I understand much better for having read your work. Good spot re: Campagnaro being less inclined to move forward despite facing virtually a one-striker formation. Some great stuff in there ZM. As Blackpool tinkered with a 3-5-2 at the weekend, this is fast becoming an area of intrigue. Demands a second reading for sure. Bookmarked for reading when less tired. If you look at the tactical function of each Udinese player, rather than where they started on the pitch, Udinese was clearly a 4-5-1. Pasqual and Benatia mostly defended, and while Pasqual made a few forays into Napoli’s territory in the second half he can’t be classified as a midfielder. Other fullbacks like Evra, Ashley Cole, and Marcelo do more attacking than Pasqual did on Sunday. Udinese’s attacks down the left were mostly done by Armero (see the second goal), while Asamoah never really penetrated from his advanced position. Did Asamoah get any shots on net? Did he made any incisive passes? Although he started in behind Denis, Asamoah was clearly a midfielder rather than the trequartista in a 4-4-1-1. He offered a quick point of defence when Armero and/or Pinzi got in behind the Napoli midfield. He was set up as a fake attacker, designed to occupy Napoli’s defenders while Armero and Pinzi, and even Isla/Cuadrado made runs from deeper. Udinese had an extra man at the back, in midfield, and gave up two men up front with Denis facing Campagnaro, Cannavaro, and Ruiz. Eventually Udinese’s control of the space in between Napoli’s midfield and defence got them their best chances – see the Inler goal, and witness how much space Armero had before crossing for Denis. For me this was the only tactical success for Guidolin on the day – exposing areas which Pazienza and Yebda could have been covering. i dont know your fascination about italian football but the tactics go out of the window when you concede possession right in the middle of the pitch when you play too narrow and most importantly on counter you are just too slow to defend . i watched this game and to be honest udinese just sat back and hit napoli on counter there were times when napoli conceded the possession right in the middle of the pitch and invited pressure they played too narrow which played in to udinese’s hand and udinese just hit on the counter they switched the ball wide and in the middle and were a much better threat than napoli . i dont know why you do such games take those games where the play is much more better rather than just tactical fascination and the intricate play is hopeless . As explained by ZM, these two teams are the most TACTICALLY innovative teams in Serie A this season and should rightfully be covered on a site dedicated primarily to tactics. Even teams such as Arsenal, Barça, Bayern need tactics to facilitate their “intricate” play. What wrong about thinking about a situation when you concede possession? Defensive tactics are as important as the build-up/offensive play. Italian football fascinates because of little intricacies such as the one used by Guidolin in this match, which you would only rarely see anywhere else. It’s not just about formations but also how these are adapted to suit different opponents. Intricacy doesn’t have to be only in skilful, stylish play! If you said Napoli played too narrow and can’t handle the invited pressure, isn’t that a tactical mistake? How do tactics go out of the window then? tactics never go out the window. every action has a reaction, actions are offensive tactics, reactions are defensive tactics. when you lose a ball in midfield, you re-group, the team shapes up to resisit, break-down, hinder & stop the opposition’s attack. 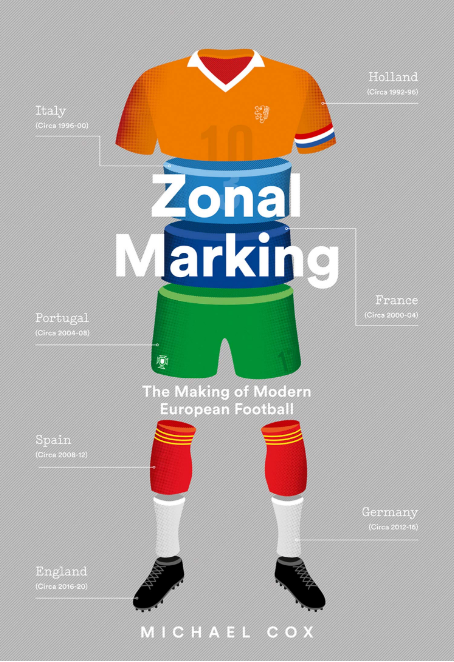 if tactical fascinations & intricate play are hopeless, what is left of football? Udinese & Napoli have been keeping you occupied this season eh? to miss important players, improvise & end up winning…hats off for Guidolin. I think playing Asamoah higher than usual should have lead to better ball recuperation at earlier stages, but also to ensure midfield superiority. Napoli’s defenders aren’t the best distributors of the ball at the back, so you can either pressure them to win the ball early, or apply fake pressure, because their passing is hardly constructive. the goals had an element of fortune in them (wonderful strike by Inler), but however you win you won. its good to see 2 innovative coaches doing so well in Serie A.
ZM, any thoughts on Simeone’s Catania? he’s following Bielsa’s 3-3-1-3 ideology, & I think if given time, his work will show next season. Simeone’s Catania? As a Catania supporter, I couldn’t be more interested. I loved Bielsa’s 3-3-1-3 and I am curious of reading your thoughts on this: unfortunately I haven’t been able to watch much, except for the highlights, but that was a thought that passed my mind during different second halves, when they had to recover (and they did, much to my joy – talking about Genoa game). Thank you for your explanation. As a matter of fact, Catania was very weak against counter-attacks lately and, but it could be a question of technical limits or little focus, was very poor in marking. Maxi Lopez has been harshly criticized this year, but I disagree: he was not that big of a scorer, but he played more for the team, passing, holding the ball, winning free kicks and opening spaces for the midfielders. I agree: if Simeone stays and we get someone else young and good, we could have a nice calm season, provided we don’t get relegated. Great sides! I hope they will be both in the CL next season.. And Inter would be out.. We need new sides with fresh ideas..
I’m afraid they are too small, as clubs, to think big. Therefore, they’ll both be eliminated. A brilliant write up of what turned out to be a lively and very entertaining game. I found that the most interesting stat I saw in Gazzetta was that Campagnaro, who you reference, was the player with most touches in the game: indicative of Napoli’s shape as well as the players responsibility to bring the ball out. Thanks for writing this game up. I love the articles, love the game, and don’t feel like writing much more other than thanks for doing this, and thanks for the constructive comments everyone.